Nowadays I am exploring the fish market a lot given Mehebub is presently not in India and we are residing in Kolkata! This situation has given me a chance to explore the nearby market in Garia. This market is available with various fresh fishes and especially small fishes from freshwater and Tangra Mach a.k.a cat Fish is one of those. Last week while hopping the market while returning from office I saw fresh Tangra fishes in abundant and most of those are full of egg (fish roe)! I then grabbed 500g of Tangra Mach and returned home happily and ended on making the Tangra Macher Aloo Begun o Bori diye Jhol. Initially, I was thinking to prepare Tangra Macher Jhal with Mustard paste which my Mom and Mamoni used to make in my ancestral house. However, while checking my fridge for veggies to make another side dish I found an Eggplant. there was a change in plan from a hard-core Ghoti dish to typical Bangal delicacy Tangra Mach er Aloo Begun o Bori diye Jhol. I used to have this runny curry with Tangra fish in my Cousin Sister’s place. Bardibhai’s MIL was a great cook and she was originally a native of Bangladesh. I still remember that great runny Tangra fish curry prepared by her with veggies. They did not use Onion garlic in their cooking but I love the flavor of Onion and garlic in my Tangra Mach er Aloo Begun o Bori diye Jhol. Tangra Macher Aloo Begun o Bori diye Jhol a.k.a. 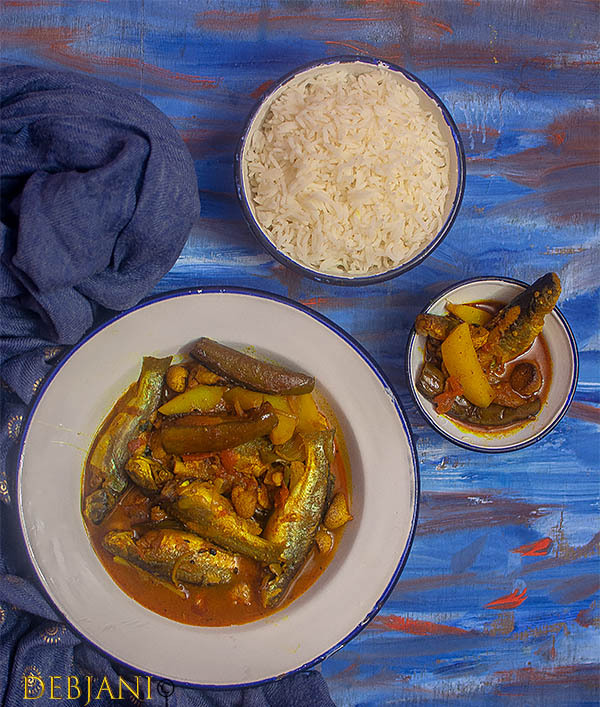 Tangra Fish Curry with Potato, Eggplant, and Dried Lentil Dumplings is a typical Bengali fish curry tempered with Panch Phoron or Bengali five spices. 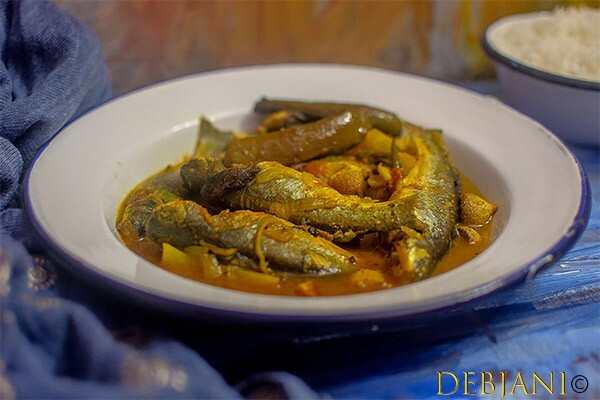 This dish is tangled with different flavors that include the fish itself, veggies and special aroma of spices. 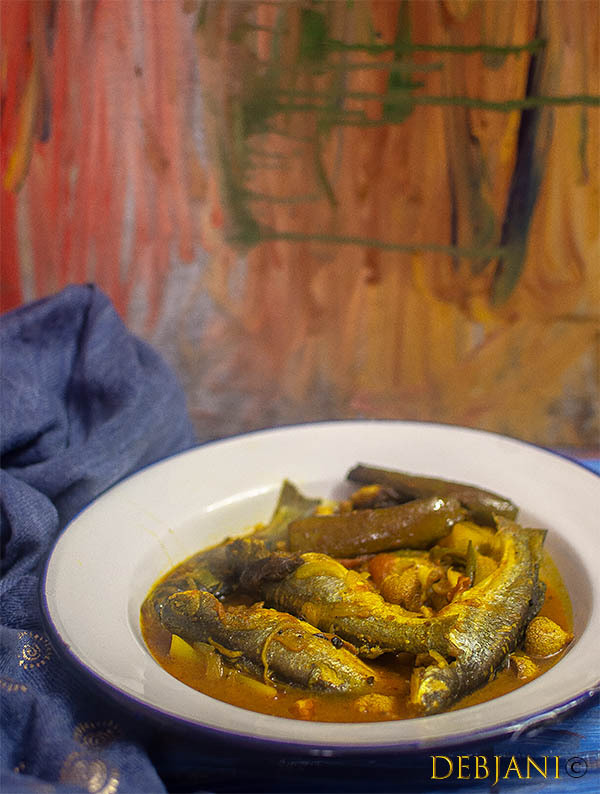 Given to the runny texture and light spices this fish curry is easy to digest and can be given to kids in case they have a tooth for fishes with bone. Here’s how I make Tangra Macher Aloo Begun o Bori diye Jhol at Debjanir Rannaghar! Panch Phoron or Bengali five Spices: 1 Tsp. Cut Potato and Eggplant into wedges. Sprinkle some Turmeric Powder and Salt over the Fishes as well as on Eggplant strips and rub thoroughly. Now heat the 2 Tbsp. oil in a deep bottom Pan and sauté Potato strips and Eggplant strips one by one and keep those aside. In the remaining oil fry fishes carefully by not breaking those in medium flame and keep those aside too. Finally fry Bori till those turn light brown in color. Take 2 Tbsp. of Oil in the same pan and temper the Oil with Panch Phoron and then add chopped Onions and fry till those turn light pink in color. Add Garlic paste and sliced Green Chili and then cook on low flame. Add chopped tomatoes and cook till oil comes from the mixture. Add Fried Potatoes and mix with the spices. Now add 2 Cup of water and cook in medium flame to bring it to boil. Add some more water if required as this curry is served a bit runny. 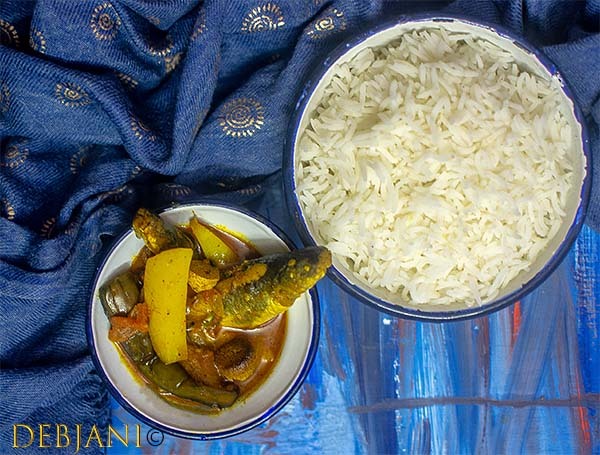 Serve Tangra Macher Aloo, Begun ar Bori Jhol with hot steamed rice. 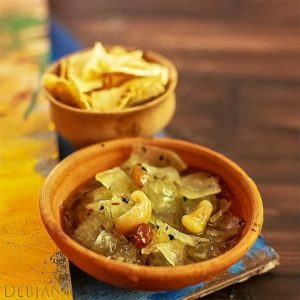 Have you tried the Tangra Macher Aloo Begun o Bori diye Jhol Recipe from Debjanir Rannaghar! « Taler Bora | Sugar Palm Fritters : A Traditional Bengali Sweet fritter aka Pakoda!